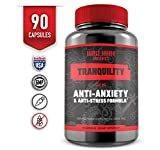 RELIEF STRESS AND SLEEP BETTER. Is anxiety a problem? A cup of natural calm might be just what you need to relax. This beautiful tea will bring serenity to your day. Our fragrant floral tea will help you relax and prepare for bed. Reach for this aromatic relaxing tea for calm support during the day and incorporate as sleepy tea into your bedtime routine. CALM YOUR STOMACH AND IMPROVE YOUR DIGESTION. Perfect cup of tea especially after meals. Chamomile organic tea will calm your stomach and help with relaxation and sleep. Soothing, calming and caffeine free tea. HIGHEST QUALITY AND PURITY. Our non-GMO tea is certified organic, naturally gluten free and vegan without any artificial flavors or colors. Sustainably farmed, our chamomile tea is 100% ORGANIC CHAMOMILE and nothing else. HAND HARVESTED AND HAND PACKAGED FOR OPTIMAL QUALITY. Our tea is sorted and selected by our team of experts at the source, untouched by pollutants or pesticides. Each box contains 25 individually sealed tea bags for ease of use and convenience, so you are never left without a great cup of tea. A great recovery drink, caffeine free tea with benefits of aromatherapy, that can be enjoyed hot or iced. EVERYDAY HEALTHY LIVING. This box contains 25 individual tea bags, but our Chamomile tea is also available in a loose leaf tea format, so you can control the strength of your brew. Explore our other similar tea selections to expand your experience and include the benefits of supporting herbs. We also offer SLEEP SERENITY, CHAMOMILE WITH GINGER, PEPPERMINT and LEMON BALM.. Find your favourite or keep all of them in rotation for a satisfying and aromatic cup of fragrant tea. Relax and enjoy this classic staple! Sip this beautiful cup of hot tea throughout the day for anxiety relief and relaxation. Let go of stress and aid digestion processes at the same time by drinking this floral tea after meals or incorporate it into your nighttime ritual and use to ease into a restful sleep. A natural organic anti anxiety and sleep tea, calming cup of tea, that will destress you and become your favourite cup of calm-herbal and true calm remedy.